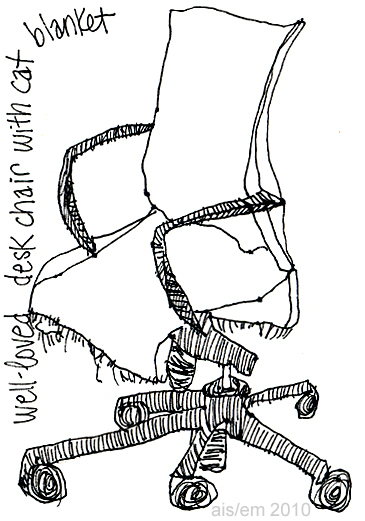 The next ATC (artist’s trading card) in my pen-and-ink art experiments features my husband’s desk chair. I drew it with a Size 0 (zero) point technical drawing pen. I’ve been using this kind of pen for art since I was introduced to them by a college friend, Darcy Grimm. The ink is called Ultradraw, and it’s Koh-i-Noor’s India ink for artists, illustrators and draftsmen. Once that ink is dry, it’s usually waterproof and I can paint over the ink with watercolor paint or use watercolor pencils with water. It’s ideal for sketchcrawls and other sketches that might become more formal artwork. To protect the chair from our cat’s long hair, we have a (now somewhat ragged) piece of flannel that’s laundered regularly. The fabric was on the chair when I drew this ATC. To print this ATC, right-click on the picture and save the higher resolution copy on your computer. Then, print the artwork at 150 dpi; it’ll be a 2.5″ x 3.5″ ATC after you trim it to size.